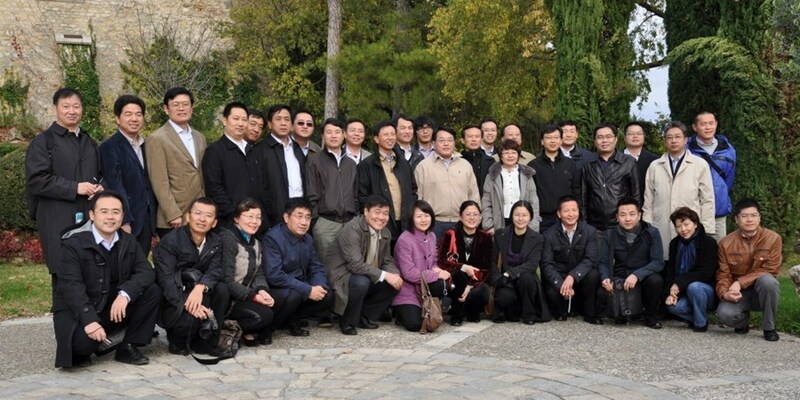 There are some 1.5 million employees at the State Grid Corporation of China (SGCC), 25 of whom were welcomed at ITER last Monday, 8 November. The visiting party, which also included members of Schneider Electric China, was headed by Yang Qing, one of the corporation's six executive vice presidents. SGCC is the largest utility in the world. This should come as no surprise, as it serves the better part of the country's 1.3 billion inhabitants. Over the past four years, SGCC has been engaged in a project called "Power for All" that aims to connect several million families in the poorest and most remote areas of the country to the national grid. China's present electricity production is based essentially (76 percent) on coal. Nuclear energy accounts for a mere 1 percent—less than renewable sources like wind or solar energy (1.5 percent). Such a heavy dependence on a fossil fuel "is not satisfying" acknowledges Yang Qing. "We intend to add 70 MW to our present 10 MW nuclear capacity in the coming decade. It is clear," he adds, "that in order to meet the growing national demand we must develop new energy sources." Yang Qing is convinced that fusion could be one of them. "We know that commercial fusion is quite a long-term perspective. But it is strategic, not only for us but for the whole of mankind."